U.S. Wine industry CEOs are at the epicenter of persistent and rapid change, and many feel like Don Quixote fighting windmills. Across California, Oregon and Washington, numerous winery owners and CEOs are expressing deep concern about shortages in skilled labor, affecting all sides of their business: ‘Not just vineyard or harvest labor or truck drivers, but across all key functions: DTC sales, marketing, accounting. 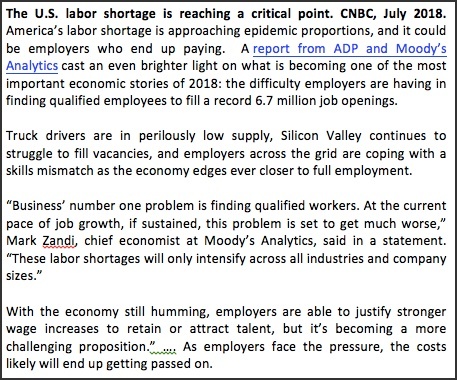 Mounting labor costs across the board are just not sustainable long term.’ See adjacent table: The U.S. labor shortage is reaching a critical point. In fact, the just released CoBank Report determines the 10-year annual compound growth rate for wages across all crops to be 3.25%, with nuts & fruits at 3.65%. Accelerating change is intermeshed with another powerful force: the increasing complexity of the problems we face make it almost impossible to lead a growing organization unlss you are committed to upping your game as a leader. It is up to you to decide. Is the future just about keeping your head above water level? Or, are you looking to grow and thrive? Hire the right team. This may sound pedestrian, but it is essential to maintain a high level of service and overall customer experience. In order to attract and retain the right talent, you should consider two things: building strong culture and becoming an ‘employer of choice’. The employees you hire are invariably the difference-makers who influence the future success of your business. They are also key influencers when you are seeking to hire new talent in a competitive labor market. I believe that cultural fit is the most important aspect of hiring and retaining great employees, with skillset following closely behind. Your team should reflect the ultimate vision of your company and represent the values, beliefs, behaviors and experiences that make up your business’ work environment. Hiring employees that don’t fit with your current or desired work culture could lead to poor work performance and decreased levels of job satisfaction. Develop people within. This may require a shift in mindset and could include the following: (1) Hire younger; (2) Seek out pockets of high unemployment and relocate; (3) More frequent but smaller raises for new employees at 6-9-12 month intervals; (4) Encourage employee feedback when they see a problem or opportunity; (5) Improve training; (6) Promote ‘family business and/or rural’ lifestyle; (7) Provide health benefits to encourage retention of hispanic field worker teams. Develop your strategic leadership skills. The single most important step a CEO can take is providing strategic direction to your team. This should not be surprising, but many winery leaders are simply not doing this and consequently, team members become frustrated, confused and less productive. Clear direction focuses the whole organization against a common vision; improves morale and material output. ‘Let all your efforts be directed to something, let it keep that end in view. It’s not activity that disturbs people, but false conceptions of things that drive them mad.’ – Seneca, On Tranquility of Mind, 12.5. 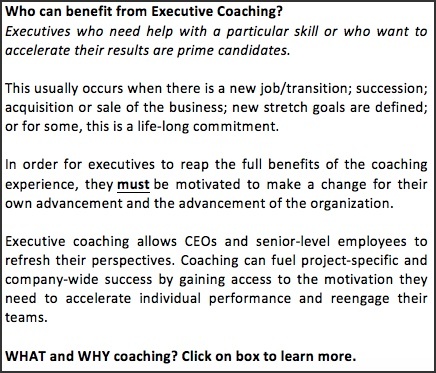 Lean on executive coaches and peer groups. Some CEOs are finding it essential to commit time more frequently to being more purposeful in addressing new strategies for survival and growth. Says Samantha Dorsey, GM, McEvoy Ranch: ‘It takes intentional planning to set aside time weekly for thoughtful strategic development, without defaulting to an endless flow of tactical execution. Deborah’s coaching process holds me accountable to working on my business’ architecture, materially increasing my productivity… continued.’ See adjacent box: Who can benefit from Coaching? Teach the art of inquiry. Asking the right questions leads to an enhanced ability to think strategically. Inquiry is an art. Too many leaders jump straight to answers to the wrong questions, or to questions that haven’t even been asked. Warren Berger’s book: “A More Beautiful Question: The Power of Inquiry to Spark Breakthrough Ideas,” encourages three questions: Why? What if? How? This sequence leads to innovative and strategic thinking. Train yourself to see the complete picture. When thinking about the future, we’ve been conditioned to describe things operationally. In order to create a complete and resonant picture of the desired future state, leaders must paint the picture in three layers: (1) cultural (describe the culture of the company/team), (2) emotional (capture emotional impacts on each stakeholder), and (3) operational (what, when, how, etc.). Go slow to go fast. Slow down, be intentional about being strategic, schedule “think time” on your calendar, do your research and know what is happening in your industry, and honor your scheduled time to do these things as you would any other meeting on your calendar. Focus on your strengths. As your business grows, you need to leverage areas of uniqueness and strength. It’s essential to capitalize on whatever factors make you stand out from your competitors. Identify and focus on your target audience and their needs. Engage and entice your target audience with benefit-oriented marketing content, special offers, informative events and services that highlight the strengths of your business and connect the customer to your brand. If you think you have already done this; think again and tighten up your strategy and tactics. Because your competition is already doing this. Data and analytics can serve as your guide. Utilizing data and business analytics tools can help you to gain further insight into your business’ strengths and weaknesses, which can be used to make data-driven marketing and sales decisions. It’s important to document useful data findings and test what your strengths are, because they may change as your business grows further. Not to mention, focusing on what you know you’re good at heightens your sense of self-satisfaction, which, in turn, increases performance and productivity, and boosting overall company morale. In conclusion, you have several options for stabilizing and growing your winery. To be most successful at managing change, you will need to think about what success looks like and thoughtfully design a transition plan for achieving this. A recent article covers several examples of successful winery transitions: Success has many flavors: three winery ownership transition stories. If selling your winery is your preferred option, consider that you first need to be consistently profitable before you start a sale process – if you are to achieve a favorable return. Be realistic about your opportunity and understand current state wine industry M&A dynamics. See adjacent box: Napa wine M&A market remains ‘robust’ despite rising vineyard, grape prices. It may in fact be easier to focus your energy on becoming a more strategic leader, implementing new strategies and building a healthier business – before considering other options. Scion Advisors has a solid track record helping winery leaders develop growth plans and execute more strategically through executive coaching. Call Deborah Steinthal, Managing Director, Scion Advisors to set up a complementary meeting to discuss how and whether coaching could work for you (707-246.6830).